Despite acquiring a good number of AEC Reliance single deckers during the late 1950’s and early 1960’s, North Western Road Car Co. had opted for the Dennis Loline for its double deck purchases during that period. It then perhaps came as a surprise when in late 1963 they received eighteen AEC Renowns (964-981, VDB 964-981) with Park Royal H43/32F bodies, followed by a further fifteen (115-129, AJA 115-129B) with H42/30F bodies in 1964. 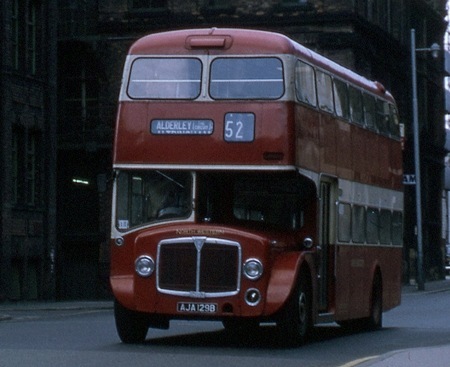 However in 1972 the NWRCC depots and operations at Stockport, Oldham, Glossop, Altrincham and Urmston passed to the SELNEC PTE, a separate company – the SELNEC Cheshire Bus Company Ltd. – being created to take over these along with an appropriate number of vehicles. All other depots and operations were taken over by Crosville, except those at Buxton and Matlock which passed to Trent, and the Manchester depot which was retained as a coaching unit only before forming the basis of National Travel (North West) in 1974. 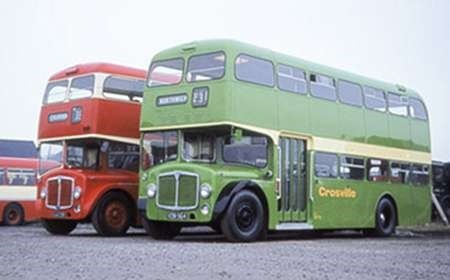 The Renown fleet was divided between Crosville and SELNEC Cheshire, who soon repainted them into their own liveries. Here we see one of each – Crosville DAA501 (VDB 964) formerly 964 and SELNEC Cheshire 9122 (AJA 122B) formerly 122, posed for an enthusiasts’ visit to Northwich depot. The Crosville bus displays the recently introduced brighter green livery. 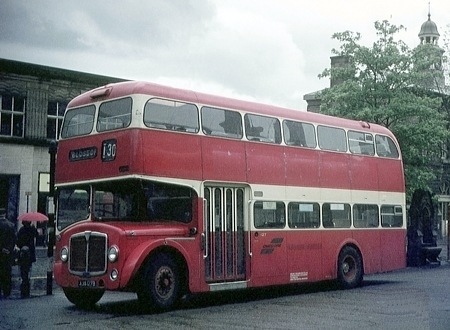 AJA 122B was later withdrawn following a low bridge accident, but sold to Churchbridge Motors of Cannock, Staffordshire, who had it repaired by Lawton Coachworks and ran it in their blue and white livery for a time. The change in vehicle policy by certain BET companies that became evident from about 1960 derived from BET central purchasing decisions which saw virtually all manufacturers other than AEC and Leyland being "delisted" as approved suppliers of heavyweight chassis, though Daimler was added later when the merits of the Fleetline in comparison with the early Atlantean became apparent. The last Dennis Lolines for North Western, which were delivered early in 1962, would have been ordered about a year before, and (excluding Aldershot & District) they were the the last company orders for that chassis. The A&D case is rather special in that the shareholding for that firm was split into three roughly equal parts, BET, THC and private ownership, which allowed a degree of independent policy in purchasing matters, hence the arrival of Lolines up to 1965. To amplify and expand on Roger’s comments, NWRCC’s purchase of the Renowns was the end of a saga started when, as part of he 1947 Transport Act, North Western found itself in the BET camp on 1/1/1948. Denied of its beloved Gardner engined Bristols, the last of which arrived in 1950,it worked with Atkinson to build a Bristol/Gardner clone. When the first small batch proved successful it applied to BET for a sanction to buy 100 more. When this was denied and NWRCC found themselves "stuck" with the groups AEC/Leyland purchasing policy, it had already decided to rebody the bulk of its Bristols and Gardner engined Guys. With double deckers forming the minority of the fleet the rebodied Bristols and Guys were added to by small batches of PD2s. By 1958 something more modern was needed and using Aldershot and District’s purchase of Dennis Lolines as a precedent, bought two batches of the Lodekka clone at a time when BET’s low height double decker preference was the Bridgemaster. Given the poor response to the Bridgemaster, AEC refined its ideas and produced the Renown. 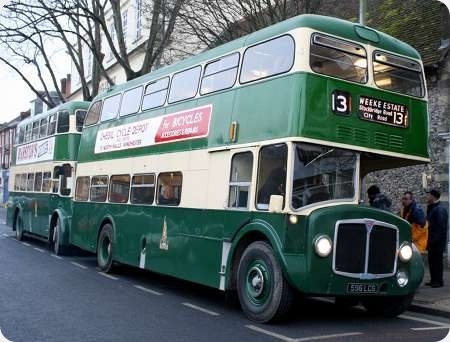 By this time many BET companies had bought the low height version of the Atlantean and NWRCC had tried both Atlantean and Fleetline demonstrators. With its low height potential, a straight through upper deck gangway and, more importantly, a Gardner engine, the Fleetline was NWRCC’s choice. For the third time in just over a decade the company found itself at odds with BET’s policy of ordering Leylands and AECs. Whilst the Atkinson episode ended with NWRCC’s Chief Engineer resigning, 1962 saw the order for Fleetlines agreed. But there was a quid pro quo. BET had discount arrangements with both AEC and Leyland and the take up of Renowns had not been enough to meet agreed targets. The first two Fleetline orders were reduced from the numbers required, the numbers being made up with Renowns and, with NWRCC’s single deck policy from 1962 being wedded to the Leyland Leopard, the company took a large batch of AEC Reliances which were offset for discount purposes against the reluctance of BET companies to purchase the Renown. As it turned out, the Renowns were very satisfactory. They also looked good in the Crosville livery as shown, the black wheels and mudguards contrasting with the green. I never realised the unusual financial makeup of A&D, Roger. And London Transport’s is another one. I assume it was in some sort of public ownership, yet it seemed to have shareholders, because Frank Pick resigned from his post in 1940 because he felt the they were not getting a fair deal at that time. If anybody can shed light on this, I’d appreciate it. A few extra points to Phil’s comprehensive comment. North Western was set up in 1924 when BAT and Tilling, who were then operating together in harmony, reallocated their resources in the area by forming the new company centred on Stockport. In practice, the Tilling philosophy prevailed in operating matters, and this was reflected in vehicle purchasing policies. Tilling-Stevens models were favoured during the late 1920s until 1931, by which time Tilling had ended its financial involvement with the Maidstone maker and acquired the Bristol Tramways & Carriage Company together with its manufacturing arm. Under Tilling’s abrasive new Chairman, J.F. Heaton, Bristol became the preferred chassis supplier for Tilling companies, including North Western, who adopted the make as standard from 1936. In 1942, the fractious association of BAT/BET and Heaton finally disintegrated, and companies were reallocated between the two groups. Rather surprisingly, given the strong Tilling direction of its management policies, North Western was allotted to the BET empire, but apart from some Guy wartime utilities, Bristol continued to be the chosen chassis make until nationalisation led to the withdrawal of that supplier from the open market. As Phil indicates above, North Western sought a "Bristol/Gardner clone" by approaching Atkinson, but BET top brass were having none of it, and the company had to conform with the AEC/Leyland regime of its group masters. Quite how North Western managed to succeed in its choice of the Dennis Loline (I quibble at the description "Lodekka clone" – the Loline III in particular incorporated several design improvements over the Bristol) I know not, but the Loline proved to be a good machine for North Western. More might well have been ordered had BET not enforced its AEC/Leyland diktat. Another factor could have been the decision taken by Dennis in 1962 to withdraw the Loline from the market, but this might well have been a chicken and egg issue influenced by the enforcement of BET central policies, leaving Dennis with only the Municipal and Independent markets at its disposal. Dennis revoked that idea very quickly, and continued to supply the Loline up to 1967. A comparison of the respective merits of the Loline and the Renown inevitably reflects one’s personal preferences, but in only one feature can the Renown claim an advantage – the incorporation of a synchromesh gearbox making life easier for the driver. On the other hand, the Loline was offered with optional four or five speed gearboxes, and North Western had examples of both. The Renown came with four speeds only, and the North Western ones seem to have had quite a high rear axle ratio which might have left rather wide gaps between the gears on the road. Having driven the Loline III in service with A&D, I am well acquainted with the model’s refined qualities. My experiences of Bridgemasters and Renowns are limited to modest trips as a passenger on the City of Oxford examples, and the Renown seemed to give a rather pitchy ride quality. The harsh engine noise, screaming gearbox note and juddery clutch action reminded me of the closely related Regent V type that I did drive around Halifax. The design was inferior also in that, in the somewhat tortuous driveline, the separate location of the gearbox on the offside behind the driver’s cab dictated the intrusive positioning of the staircase into the entrance platform. I remember the slightly sunken lower deck gangway of the Bridgemaster (like the LD Lodekka and Loline I and II) but cannot now recall if this feature was true also of the Renown – the Loline III had a completely flat floor throughout. I never realised the unusual financial makeup of A&D, Roger. And London Transport’s is another one. I assume it was in some sort of public ownership, yet it seemed to have shareholders, because Frank Pick resigned from his post in 1940 because he felt the they were not getting a fair deal at that time. If anybody can shed light on this, I’d appreciate it. You are quite right, Chris. The London Passenger Transport Board financial structure was not the same as that of outright nationalisation, which did not occur until the London Transport Executive was set up on 1st January 1948. When the LPTB was formed in 1933, the companies taken over, notably the Underground Group and Tilling’s London operations, were ‘bought’ partially with cash and partially by the issue of interest bearing stock – C stock – authorised by the enabling Act, which meant that those former businesses continued to earn yields from their holdings. However, by 1938, the net financial performance of the Board was so weak (partly because of the truly massive investment in high standard Underground equipment and buildings, bus fleet renewal, and a serious strike in 1937) that the future of the entire LPTB concept was temporarily placed in doubt. In the previous two years the Board paid only 4% instead of the agreed rate of 5.1% on the C stock held by the former transport operators, and suggestions were made that a receiver should be appointed run LPTB matters. In fact, the stockholders had not lost any capital value on their holdings as the purchasing terms in 1933 had been somewhat generous. Evolving international events in the months following, which escalated into WW2, led to attention being directed elsewhere, though clearly Frank Pick was not mollified. In the postwar years, London Transport became a component of the Labour government’s nationalisation programme. Roger, when I used to hang around Charles St in the late 1950s/early 1960s, I got to know a good number of people in the garage, workshops and offices. In those days there was a culture of encouraging young enthusiasts and I was told many tales by people who had served with the company from pre-war days. From what I was told, the company fought hard to be moved from BET to the Tilling empire once the ramifications of the 1947 Transport Act became clear and at one time was led to believe that a transfer would take place. The story goes that either Crosville or Cumberland, both major Leyland users, would take NWRCC’s place. Now I have never been able to prove the truth of the story with documentary evidence but given the sources, the enthusiasm of NWRCC for Bristol products and its continuing attempts to thwart BET’s purchasing policies it has a ring of truth. As far as calling the Loline a Lodekka clone is concerned, I understood all chassis were produced under licence and whilst the MK3 was very much a Dennis vehicle, the arrangement held. I doubt that NWRCC would have ordered any more Lolines. Its surrounding BET companies were already using Atlanteans and the Fleetline was on the wish list of some of them. Dennis’s temporary withdrawal of the type was probably co-incidental given the Fleetline trials prior to the withdrawal. As I said, and this comes from conversations as late as 1965, the Renowns were a quid pro quo situation and were not a Loline substitute. Chris, I think the last straw for Frank Pick was the compensation enforced by the government for taking control of the railways in wartime. The arrangements for repairs, including war damage, were also harsh. The railways accepted these conditions reluctantly but without protest as fears of an invasion were very much to the fore at the time. Bus services were also slashed with little thought at the outset of the differing conditions of the operators. 595 and 596 LCG are AEC Renown 3B2RA vehicles with Park Royal H72F bodywork from the fleet of King Alfred Motor Services of Winchester, and date from 1964. They are both seen during one of the famous Running Days on 1 January 2009. Note the different applications of the livery. Are you sure it’s different livery and not different light? [The mirror is in a different position though.] They are a rather splendid pair. We await developments with a replacement for the New Year running days. David, Thanks for your comment. Yes, it most certainly is a different green. The two photos were taken on the same day and in similar conditions. I compare it to the different applications of Aldershot & District or West Riding against Southdown. I do believe that 595 is lighter green. On my computer screen the greens look fairly similar or "why bother with two such similar colours" but on an ipad ("Retina" screen?) they look distinctly different. Like David, I suspect that this is a trick of the light. I saw the King Alfred (R. Chisnell) fleet pretty frequently, and rode on it occasionally, when I lived in Hampshire from 1966 to 1975, and I recall only one shade of green being used. In fact, I did attend an interview in 1971 to see about a job in the Traffic Dept., but I was less than impressed with the outfit at that stage and didn’t pursue the matter. It was no surprise when it simply folded two years later. King Alfred did change their livery in the last years of operation. The upper picture of 595 LCG has the later (final) livery, all the same shade of green. The lower 596 LCG has the earlier livery with the darker shade of green at lower deck level. I think I have stated this correctly, unless the old grey cells are misfiring. 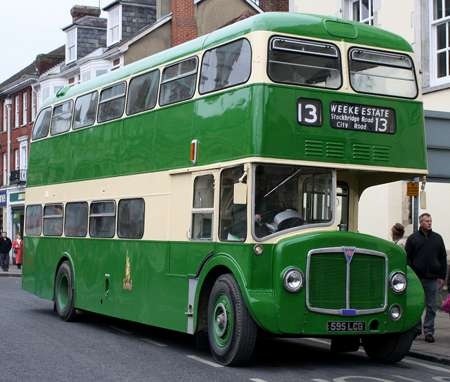 (There was a coach livery too in the fifties and sixties, described as "eau-de-nil" – a sort of pale green, with a green stripe or flash related to bodywork embellishments). According to "King Alfred Motor Services: the Story of a Winchester Family Business" (James Freeman & Robert Jowitt, Kingfisher, 1984), the later livery first appeared on the four Leyland Atlantean PDR1/2s (589-592) as a result of a mistake by the Roe paint-shop. Not only was the Brunswick green omitted from the lower panels, but the wheel centres were painted red – this was because these four vehicles followed on from a larger batch (101-125) of almost identical vehicles for West Riding, in whose livery they were mistakenly painted. Apparently, the Chisnell family (the Directors of KAMS) were quite taken with the result, and decided to adopt the simplified livery (although, I think, without the red wheel centres) as the fleet standard. This raises a number of questions! Firstly, how can a paint-shop get things so wrong? – even though the application of the KAMS livery was in the same proportions as WRAC’s surely the different destination apertures and application of KAMS fleet-names/legal lettering etc. might have suggested that the four Atlanteans concerned should have not received WRAC livery? . . . and what about final quality control? Secondly, the light green – was the KAMS light green exactly the same shade as WRAC green? – Freeman and Jowitts’ story suggests that the same light green was used on both the WRAC and KAMS buses. So. Were KAMS offered a cheaper price by Roe if they took the four Atlanteans to more-or-less West Riding specification as a follow-on order? – the bodies are more-or-less identical except for destination aperture, an extra horizontal grab-rail behind the near-side windscreen on the West Riding bodies, and the Atlantean badge on the front of the KAMS buses. Were KAMS persuaded also to use West Riding green as being very close to their own light green? . . . and was that mis-interpreted in the Roe paint-shop as an instruction to use WRAC livery, full-stop? This former North Western bus still in its original livery but with SELNEC (Cheshire) fleetnames is at the Norfolk Arms terminus in Glossop in May 1972 not long after North Western was split between SELNEC, Trent and Crosville. This was one of the second batch of these buses bought by North Western in this case with forced ventilation evidenced by the lack of opening windows. I wonder how effective this was in dispersing the cigarette smog more or less standard on the upper decks of buses in those days. I pass this location from time to time and wonder at how there could have been a busy bus terminus at such a busy location. A full list of Renown codes can be seen here. The Norfolk Arms was busy and similar to the LPTB Hounslow trolleys, the traffic signals were controlled by the driver when ready to depart. I think it was mounted on the pole just by the driver’s cab in the picture. This turned the High St W and E, Victoria St and Norfolk St lights to red and then the bus would sweep out. I have it on good authority this led to at least one conductor being left behind. The old North Westerns from Glossop had a few characters. I felt bereft, as a student in Manchester, missing my AECs from STD, SUT and the local coach operators. Luckily North Western plied down the Wilmslow and Palatine Roads in student land. It might have been a Fleetline or a Loline but my day was always made when one of these Renowns turned up to take me home. These PRV bodies have, unfairly in my opinion, been called ugly. Compared with Bridgemasters – especially the forward entrance version – these were positively beautiful, and in their own right were better looking than many contemporaries. When NBC was set up many fleets were shuffled around like decks of cards, and Northern General was no exception. At Percy Main ‘Tynemouth and Wakefields’ we had a number of Daimler Fleetlines sent off to different areas and got all sorts in return, among the number were six Renown’s that came from East Yorkshire’s fleet. I was in the minority but I quite liked them, especially if you got one on the likes of the 306 or 308 where you had some long gaps between stops, but they could be hard work on some of the town service routes that stopped at every other lamp post. I have to agree with David that this version of the Park Royal body, combined with North Western’s style of applying the livery, is FAR better than the version on the Bridgemaster or on Southampton’s Regents and PD2As. Those things were little better than shoe boxes with windows. It’s not far off the style Oxford had on their …CWL Regents, and it really was quite good! I agree with David that the Park Royal Renowns were a big improvement on the Bridgemaster but I wouldn’t go as far as to say they were beautiful. The only Renowns that can justify that accolade in my opinion were the East Lancs bodied versions operated by Leigh Corporation. There were both rear and forward entrance versions in a wonderful blue and cream livery. Fortunately one of the forward entrance vehicles is still with us at Boyle Street museum in Manchester. Wearing my driver’s hat, I can imagine a Fleetlines’s attraction for stop start over a manual AEC – much as I personally prefer the latter. Significantly, the North Western Renowns had been "downgraded" from long trunk routes, only to be reinstated by Crosville when they had taken over the Cheshire operations. They claimed they were better out on the open road and could maintain "a head of steam"! As I’ve already said I quite liked the Renown’s, but by the time they came to us most of the routes for which they would have been ideally suited had either gone over to, or were in the process of being changed to OPO, as for them having "a head of steam" they could clip on a bit, and unlike the PD3’s, where after a prolonged spell of stop start braking where the brakes become a tad warm and tend to fade, you could guarantee the Renown’s would stop when asked to. East Lancs also bodied Renowns for Leicester in both front and rear entrance versions on of the front entrance ones regularly appeared on the rally circuit 190 DBC 190C. My own favourite Renowns were the ones owned by East Yorks in their traditional livery complete with modified upper deck window pillars to negotiate Beverly Bar. Regarding the beautiful East Lancs-bodied Leigh Renowns, Philip Halstead mentions there is a forward entrance example preserved at the Manchester Museum. Their rear entrance Renowns were always great favourites of mine ever since I saw the front and rear view photographs of one of them in Buses Illustrated when new. In 1976 I bought 28 (1975 TJ) for preservation from GMPTE, but in the 1980’s sold it and it then passed through several subsequent owners – maintaining a very low profile in the process. 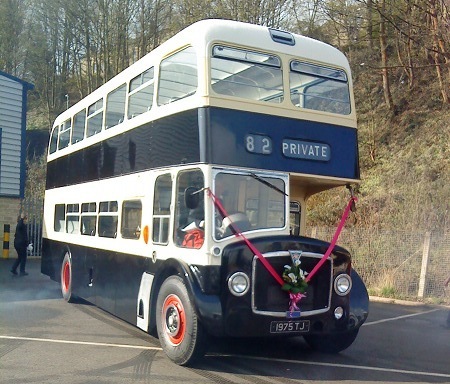 Only last week I learned that it been acquired by Tony Blackman for continued preservation, and who knows…..maybe operation in his Yorkshire Heritage Buses wedding hire fleet, though I do hope that it doesn’t turn black and white in the process. The beautiful azure blue and cream Leigh livery would be very much in demand by would-be happy couples I would imagine – it would match the bridesmaids’ dresses and floral arrangements ! Leigh 28 at Luddenden Foot, it has been working hard this summer for Yorkshire Heritage Buses. This shot was on her first day in service and as can be seen it is in black & white John. Here is a picture of fellow Renown AJA 129B in Manchester, en route to Alderley in true North Western days. I have to admit that personally I much preferred the North Western Loline IIIs to the Renowns in both appearance and performance, but it would be nice to be able to detect something of the variety and individuality of the psv designs of those times in the present day crop of tediously indistinguishable bus types. Thanks Geoff S. for sending the photo. I hadn’t realised its restoration had advanced so far, I may well then have seen it at a distance and mistaken it for the ex-Southampton Regent V. As for the livery……….I’ll say no more. Black marks for the new livery, then, John? Is black a good colour for a wedding or do they do funerals as well. So where have you been for the past year and a bit? Have you forgot how to send emails? It’s a dual-purpose vehicle, Spencer; white for weddings; black for funerals! Tony Blackman’s "new" livery is in fact that of Lockey of West Auckland, and presumably was prompted by his acquisition of a full-fronted Regent V/Park Royal which (although new to East Kent) had been operated by that famous County Durham independent. That particular vehicle also carries Lockeys titles while the rest of the heritage fleet don’t. We all have a lot to thank Tony for – in my personal case for an unforgettable ride through the Mersey Tunnel on his ex-Halifax Regent III. What a pity that his revived Halifax JOC no longer operates stage services in the original glorious livery! I suppose so David, but the thought of how it could have looked in its proper livery leaves me feeling blue. The black and cream livery used by Yorkshire heritage buses is derived from the colours on a former East Kent AEC Regent V which is in the livery of its last owner Lockey of St Helens Auckland I saw the ex Darlington Guy saloon in the livery recently and it looked very good indeed. Better in a livery than a scrap yard! I used to drive these Renowns, 127b, & 129b, in the 60s at the North Western Altrincham Depot , a nice drive but a bit on the ‘Bouncy’ side!! I was a summer guard with NWRCC at Glossop Garage between 1960 and 1962. It was the guard that operated the lights at the Norfolk Arms terminus and you had to be mighty quick to get back to the platform, clutching Setright and money bag to grasp the platform pole before the driver moved off. Bristol K5G’s were OK but a PD2 was fast off the mark and you held on like grim death for the swing round. Those were the days – swinging loads on the old 125 to Manchester and overloads on the 85 to Buxton on summer days. It was a great company with great mates at Glossop depot. Public service at its best! Roger, be thankful it was a PD2 and not a trolleybus or you’d have been left standing. Roger, Being one of the Two colleagues that Keith refers to can you supply any names of staff at all. All part of an on going, and growing, North Western project of ours.